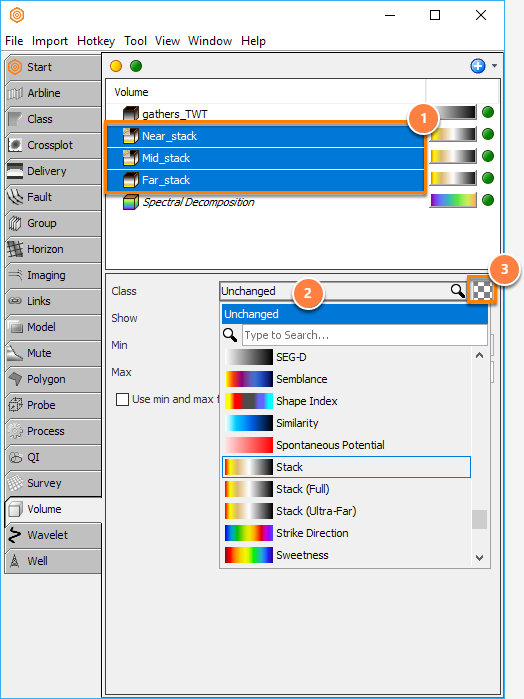 In Insight, colour schemes for various items are grouped in reusable "Classes", which you can create, view and/or edit in the Class tab in the Control Panel (see Classes and Colourbars Overview). These classes comprises a colourbar, minimum/maximum interpolation, wiggle and track view settings. They can be associated with multiple items and these items share exactly the same display parameters. Assigning classes (default or custom) to items is an easy process and can be done directly at the details panel or the configuration window. In the Volume tab, select the appropriate volume. In the details panel, select the Class search box to change the class. Select one or more volumes to update their display settings simultaneously. In the Volume tab, select multiple volumes. CTRL + A: select all volume. CTRL + left mouse button: select multiple individual volumes. Shift + left mouse button: select a range of volumes. In the Details Panel, click the Class search box to select a new class. Click the square colourbar icon next to the search box to open the Edit Class window (see Editing a Class).